You successfully reported this submission. Hey everyone! Today, I have another one command for you guys! Wind Elemental Techniques in One Command! 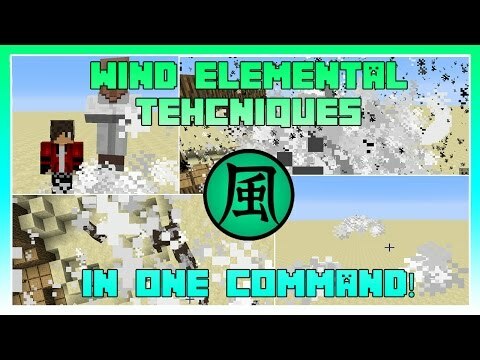 This command adds in wind armor and special techniques you can use to fight mobs and players! I will continue to make lightning, earth and ice techniques in the future! Like and Subscribe for more one commands! To get a command block, type /give @p command_block in the chat. Once you have a command block, right click it to open it's GUI. Now, you must copy and paste the command from your browser into the game. Select the entire command from below, then right click and press 'copy'. Finally, you can press done to exit the GUI, and execute the command block by powering it with a redstone block, a lever, or any thing you can get your grubby hands on. Just make sure you don't place it on top of the command block, or the machine will not be installed! # This user did not upload the source commands!